The beauty of any timber frame home begins to be understood in the design phase. The time spent by the architects working on your timber frame home can be seen by all for years to come. 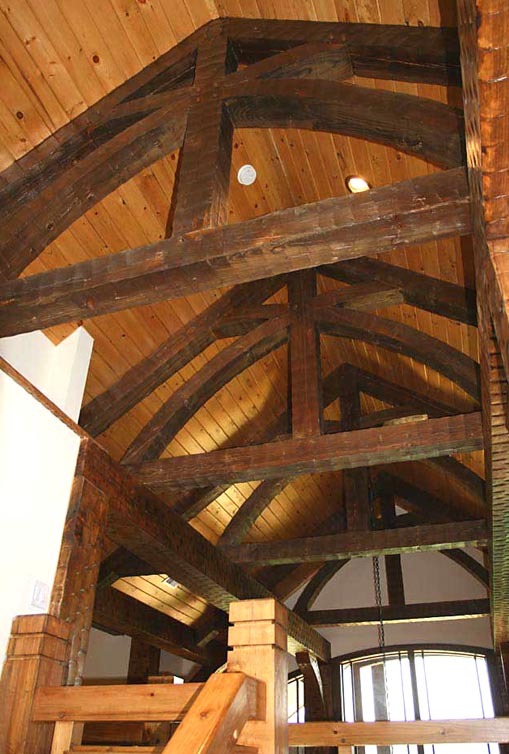 As a premier timber frame architect, our firm strives to turn the custom house of your dreams into a reality. The company designed this custom timber frame home in the Sevierville, TN area as a retirement dream home for a delighted couple. (C)Copyright 2010-2012 Home Architect, PLLC All Rights Reserved Worldwide. Why Choose HOME ARCHITECTS ® as Your Timber Frame Architect? the pages of international books and magazines throughout the world. 2. VALUE ENGINEERING: Being custom timber frame designers, the architects at this firm understand how to Value Engineer your heavy timber house. Value Engineering with regard to heavy wood timbers includes analysis of how to get the most bang for your buck. For instance, some people want a genuine, authentic timber frame. Others just want the look, but don’t want to pay for the real deal. This company has methods to accomplish this for pennies on the dollar. 3. RESPONSIVENESS: having your architect be available is important to you and it should be to them as well. Here you are, having a wonderful custom timber frame house designed and paying for the privilege, so you have a right to expect that your designers will get back to you in a reasonable amount of time, if not immediately answer the phone when you call them. Rand Soellner, senior staff architect of the company is available and pledges responsiveness to all his clients. 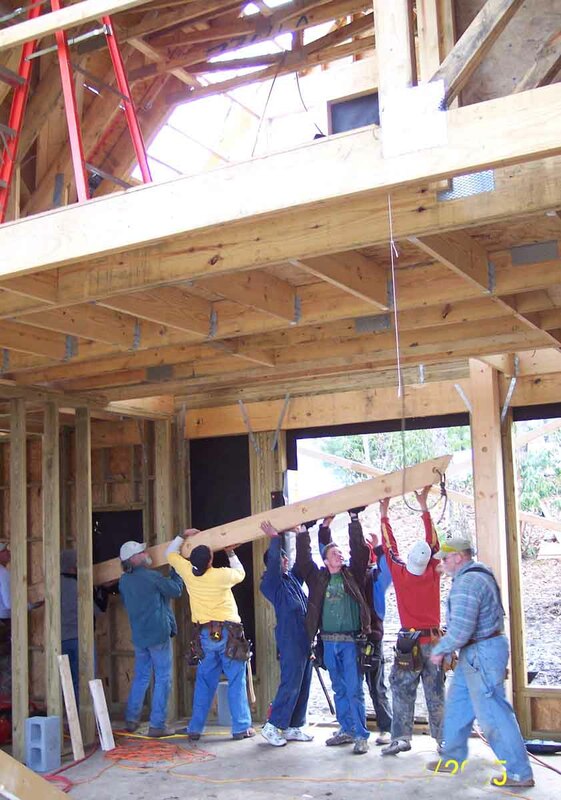 timber frame fabricators to insure that systems integrate properly in their designs. Harmony is a quality timber fabricator located in Boone, NC. Shown in the photo from left to right: Harmony CEO Ted Lowery, shaking hands with Rand Soellner, Merry Soellner, mascot Buggie Soellner, Jim Kanagny Harmony Sales, and Kris Kuhn, Timber frame Process Manager. (C)Copyright 2003-2012 Home Architect,PLLC, All Rights Reserved Worldwide. Anyone may Link to this webpage from your website using this anchor text on your website: timber frame architects. Post and beam designer Rand Soellner creates rustically elegant stone details along with the custom timber accents. All images copyrighted by Home Architect, PLLC. Rand Soellner, the company senior staff architect, remembers working for a Tallahassee, Florida architectural firm, where he was the young, architect-intern designer from the University of Florida. This was quite a few years ago. Rand said that the company had timber frame architects working on a Boy Scout Camp project being built and he went to check on it a few times. The project used large diameter log posts and heavy timber beams. “You could smell the cut wood’s fragrance in the very air you breathed,” said Soellner. Some of the wood frame members had creosote treatments, something that is not allowed anymore. Soellner recalls the pungent and not entirely unpleasant biting aroma of that preparatory treatment. But mainly, the physical, almost psychic “presence”, of the massive wood members “called to me,” said Soellner, “something about being architects and designing these giant-sized Lego – blocks has an irresistible appeal for me. It’s like I can feel a timber frame’s “gravity,” pulling me to the posts and beams, respecting their age and sense of permanence.” Since then, Soellner has used timber frames in his work, whenever clients requested it, or it seemed appropriate. Harmony Timber Works uses this special German machinery (Hundegger) linked to computerized cad-cam fabrication systems to speed and improve the quality of their joinery and components. The architects enjoy working with timber frame companies of this caliber to insure that you receive the best systems possible for the lowest possible cost. Our firm working with timber frame company. Role as custom timber frame architects. These heavy timbers define a structural coffered ceiling in a Kitchen-Breakfast-Keeping Room in one of the company’s homes now under construction in the mountains. Examples of our work as timber frame architects are displayed in this Ravenel Ridge Highlands community. This muscular approach uses 12 x 12 Douglas fir timbers in the post and beam configuration you see here, to support upper levels. The area shown here is going to the the Kitchen and keeping room. Probably not many people know what a “keeping room” is. That is the place in which you keep your guests while you are preparing a meal, until you all retire to the dining room. In this approach here, the Keeping Room was conceived by staff architect Soellner as a sort of informal sitting room in the same general area as the Kitchen, to facilitate conversation from Kitchen to Keeping Room guests. This area also serves as an informal dining space for the owners. Grand views of the Blue Ridge mountains refresh the occupants. Our Timber Frame Architects created this big-beamed kitchen-dining space for clients from Atlanta in their North Carolina estate. (C)Copyright 2005-2012 Home Architect, PLLC, All Rights Reserved Worldwide. 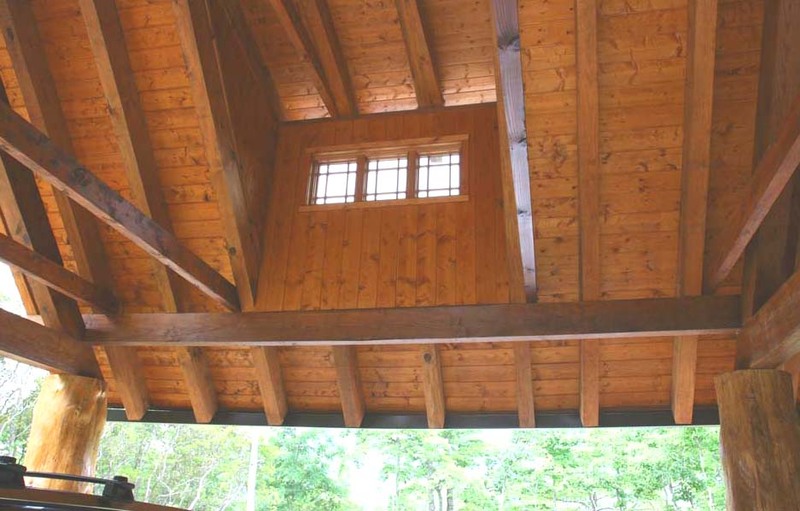 Our company, in association with engineers, has developed a unique and surprisingly economical method of reinforcing tall gable window walls with timber posts that knit those 24 foot-plus tall wall framing members together to resist the 120+ mph winds that mountain houses can experience in the Cashiers, Waynesville, Sylva and Franklin region, as well as other locations. The result is a wonderful exposed timber post detail that has a nice mountain lodge appearance that adds warmth to the space and value to the house. Our company designed this custom timber frame house in western North Carolina. (C) Copyright 2004-2012 Home Architect, PLLC, All Rights Reserved Worldwide. (C)Copyright 2005-12 Home Architect, PLLC, All Rights Reserved Worldwide. Hybrid Timber frame house Designed by staff architect Rand Soellner. Project duties performed : custom Post and beam architects, custom residential architecture. Our architects created several houses in a special mountain lodge series for an entire community. The developer loved one of our 4BR-4Ba-2car plans and wanted to use it as the main offering, but it was agreed that the elevations should vary to give the neighborhood interest. Various timber frame configurations were developed for variety. (C)Copyright 2005-12 Home Architect, PLLC, All Rights Reserved Worldwide. Heavy timber frame home Designed by staff architect Rand Soellner, AIA. Work on this effort included : timber and log house architects and custom log design architectural services. An alternate elevation to the original, with cupola, large front shed-roof dormer, small shed roof dormer and side-load garage. Our Timber frame architects designed this Adirondack Dream house for a speculative builder in Western North Carolina. (C)Copyright 2003-2012 Home Architect, PLLC, All Rights Reserved Worldwide. Builder’s House, 3BR-3-1/2Ba-2Car Porte-Cochere, Lake Toxaway, NC. 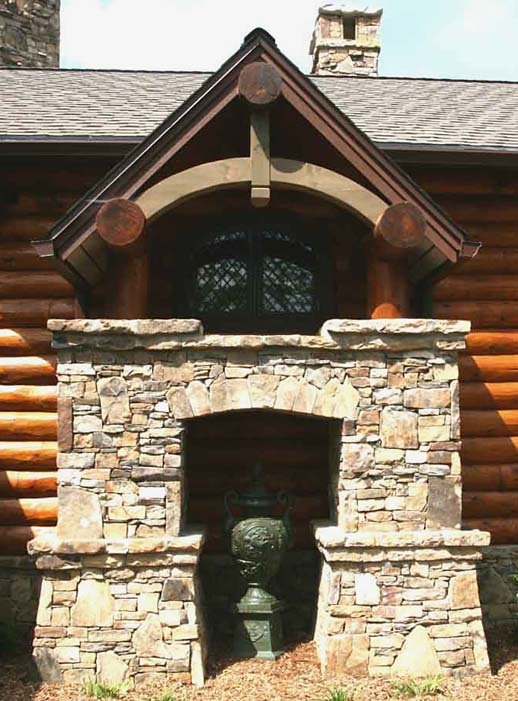 As custom mountain architects, Home Architects ® learned how to apply a hybrid combination of details. The company also was log cabin designer on this interesting Lake Toxaway project. The firm really enjoys exciting projects like this Adirondack Dream house design. As an architect, the firm is willing to design custom timber frame projects all over the USA & planet. The company’s physical location is in Western North Carolina and from there, they design Custom Houses, Post and Beam residences, Timber Frame Homes, and other Luxury Residential Architectural Projects wherever your project may be located. People with the company do not have to live in your town in order to design for you. The Blue Ridge Mountains stop at a plateau where there are some tiny mountain villages. This is part of the local zone for the company (although creating projects Worldwide). In the firm’s home office base, they function as Cashiers NC architects. They also work in Lake Toxaway, Glenville, Highlands, Rosman, Brevard, Asheville, Charlotte and other towns both local and much farther away, with one client from Hong Kong. The company has projects and/or inquiries in and from: Tennessee, the Grand Canyon area, Idaho, Montana, Yellowstone National Park, Yellowstone Club. They also designed a nice home for a Virginia client. They have a possible project from Connecticut and another from Pennsylvania. Soellner is working on one heavy wood frame project in Washington state. Staff architect Rand Soellner, AIA, NCARB, ArCH, LHI regularly designs custom projects in the Appalachian Mountains chain. They have project experience in Indiana and Florida as well. Staff architect Rand Soellner grew up in South Bend, IN, where he designed and worked building houses with his father and grandfather. Soellner would be happy to design projects in Oregon, Wyoming, Alabama and Vermont. Soellner lives and works in the Blue Ridge Mountains daily. They also designed a very nice log house for a client in northern Illinois. They have experience in design and construction of a project in Kentucky. Also, the company is open to creating new residential designs in cities and countries all over the planet. For instance, the firm is interested in designing your projects for your land in West Virginia, where they have a design nearing completion in the Glade Springs Resort area. They do not want to forget those of you in Colorado, Wyoming, or Louisiana, Alabama, or New Hampshire, either. Anywhere on the Earth, this company will design your timber frame project for your location. Timber frame architects (that is this page; you are already there). 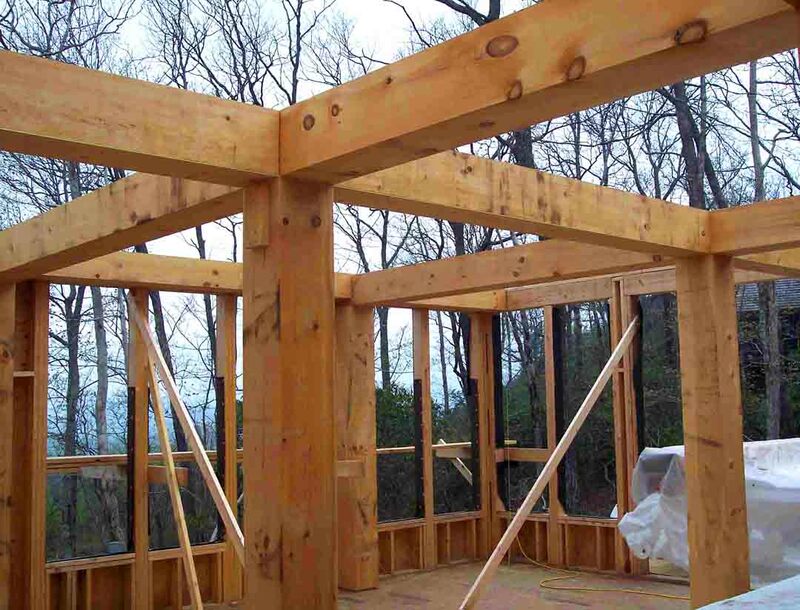 timber frame design project in Highlands, NC under construction. post and beam : some history of post and beam and its beginnings. We are assembling our custom timber framer fabricator network across the North American continent and the world. If you are a timber frame company who would like to represent a particular multi-state region in our network, please contact HOME ARCHITECTS ® to begin this association of respected timber frame businesses. We are growing this network to have a group of dependable timber framers whom we can suggest to our clients who happen to have a residential project in your area. The goal is to have professionals that will serve our mutual clients well and to exceed their expectations of quality service and value.